Deskless Guest Dashboard software for Salons/Spas is all about Today and what is happening right now. The front desk loves it because it’s always current and the information is all in one place to care for the guest from check in to check out. When checking in, no need to ask her name, you recognize her picture on the tablet as you walk over to greet her. The service providers love deskless software for salons/spas because they are connected and able to see their up to the minute schedules, view and add formulas, see sales history, write a personal note and recommend product for the guest from their phones. The deskless guest dashboard software is constantly in motion as sales tickets are adjusted, notes are passed and notice that the clients haven't arrived, are in having services or have already checked out. Guest drop off the list when checked out. The Guest Dashboard is empty at the end of the day but if not, run a no show report for management. Every move is tracked in real time so the information is always up to date and accurate. On site or off, you can see what is happening moment by moment. 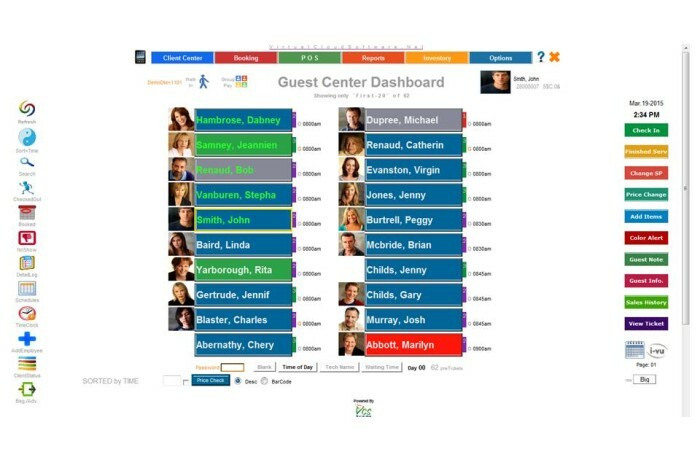 Mobility enables everyone to operate a personal deskless guest dashboard as it relates to serving their clients TODAY. Secure areas cannot be accessed by everyone. It is all about personal focus on the guest and pulling together as a team to make the experience wonderful from touch point to touch point. One touch away on a smart phone or tablet are personal notes, sales history, product recommendations, medical profile, formulas rebook next appointment and more. Go Green! Virtual Cloud Software Guest Dashboard is one touch away from anything needed at the moment. The success is evident in the improved average sales tickets. Let us help you discover the power.